You may have been paying for Apple Music now for three years and in all that time, you probably haven't explored a fraction of it. That is partly because the service has grown, and it is partly because it had odd bugs at the start. This is all typical Apple. 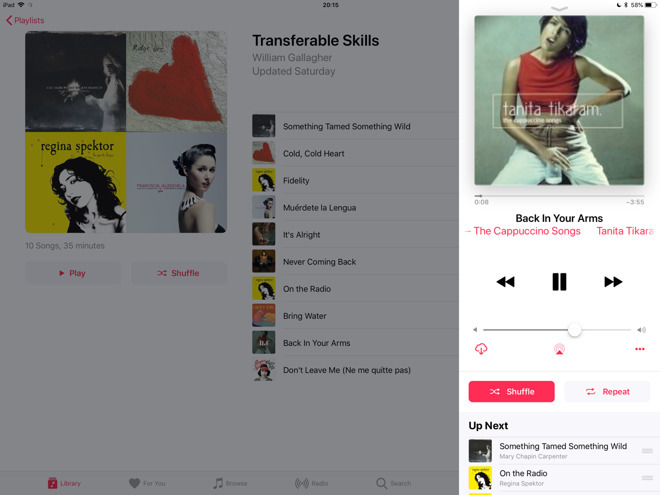 What you see every time you start using Apple Music on iOS, Mac or Apple TV is as simple as a look and feel as the company can manage. However, behind the scenes, under the hood, and often just a swipe away there are options to make you adore this subscription service. IF you're a beginner with Apple Music, this is a great start. If you've been subscribed for years, read on anyway —there might still be a tidbit or two for you. It doesn't matter how great Apple Music is if you can't listen to it. And while you can get the service on your Mac and your Apple TV, it's likely that you'll listen most on your iOS devices. These are the ones that will get you caught short if your commute is through bad reception areas or if you're really up against your data limit. You need to think ahead. Apple Music lets you download anything you want so that it can be available wherever you go. Only, this is exactly why new users get a confusing message the first time they try Apple Music. It asks you whether you want to Keep Music or Delete & Replace. This is less confusing than it originally was because now Apple shows an unusually long explanation for what the choices mean. If you choose Keep Music then any tunes you already have on your iPhone will stay there. You'll get all of the choice of Apple Music, but you'll still have your original music right there on the phone. The alternative is to let Apple Music delete it all and replace everything with copies from its own library. In both cases you (should) end up with the same music to listen to. 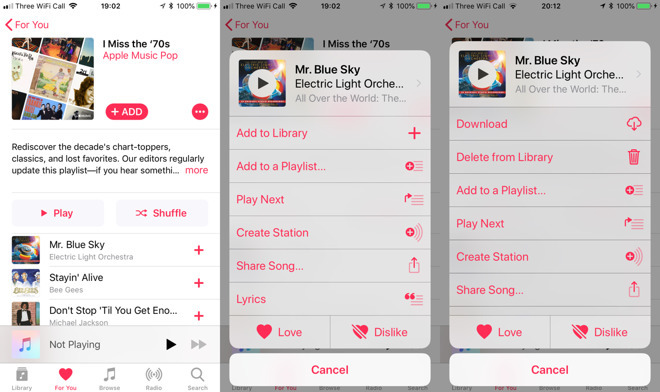 Be aware, though, that Apple Music will delete your copy of a tune and claim to replace it with the identical same one from its own collection. That doesn't mean that it's the same. We've had Apple Music replace an album track with a live version and we've had it replace one song with a completely wrong one. So clearly the sensible choice is to tap on Keep Music. Except, it's actually more likely that Apple Music will replace your version with a much higher-quality copy. Do this instead. On your iPhone or iPad, choose Delete & Replace. However, on your Mac, choose Keep. This way you get the benefit of the highest-quality audio on the move and a backup of your most important recordings on your desk. You don't get this question and so you also don't get this confusion with Apple Music on Apple TV. As that black box is so little, it streams everything and there is neither an option nor a need to keep or download anything. 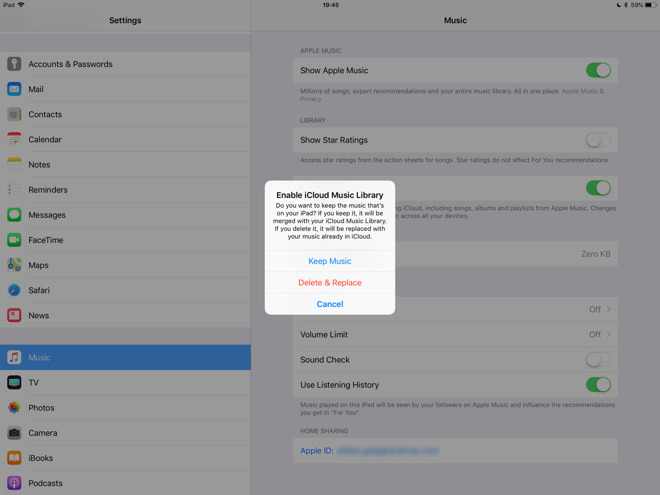 Whereas on your iOS devices, you need to also select music that you want to download and keep for those rough commutes. Don't do this as you're picking up your keys and heading for the door. Do it the day or at least a few hours before. While you can mark any Apple Music track to download, that music has to then be copied to your phone. If you mark every Sheryl Crow album to download, it could take a time. If you mark The Beatles, you'd best grab a meal while you wait. Also, you have to do this on the device you're going to be listening to. So actually it's sensible to download it all onto both your iPhone and iPad. On your iPhone, find a song and to the right of the title there will be a button with an icon. It's either going to be a plus sign or occasionally an iCloud one with a downward arrow. If it's a plus sign then you could press and hold to get a menu of options to do with playing next in a queue or adding to a playlist. Just tap the plus sign, though, and Apple Music will add this track to your library. As soon as you've done that, the plus sign icon turns into the iCloud one. You can press and hold to get that an almost identical menu. Or you can just tap it again and now that song will be downloaded. It's quicker to do this to entire playlists than to individual songs, though. Go into a playlist on your iOS device and at the top next to the cover artwork there is an Add button and another one with ellipses in. 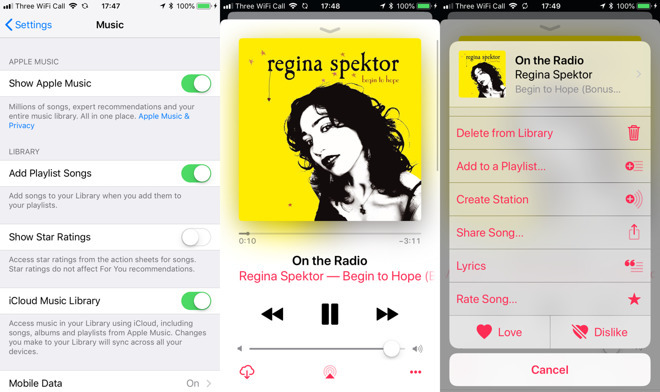 Tap Add and all the songs on the playlist are added to your library —and the button changes to that same iCloud one with the download arrow. Tap again and it'll all be downloaded. The button with ellipses also lets you add to your library or add to a playlist. Choose Add to Library and the options increase: you now get a download button and everything on that list goes onto your phone. You know that if you stop subscribing to Apple Music then everything you listen to through it will vanish. Naturally that even applies to music you download but even if you're still paying, it is possible to lose everything. It is still possible to do all of this tapping and downloading only to find the music suddenly vanishes. There's not one consistent reason, unfortunately. It does happen sometimes after an iOS update which suggests it's to do with Apple offloading music when it needs space. 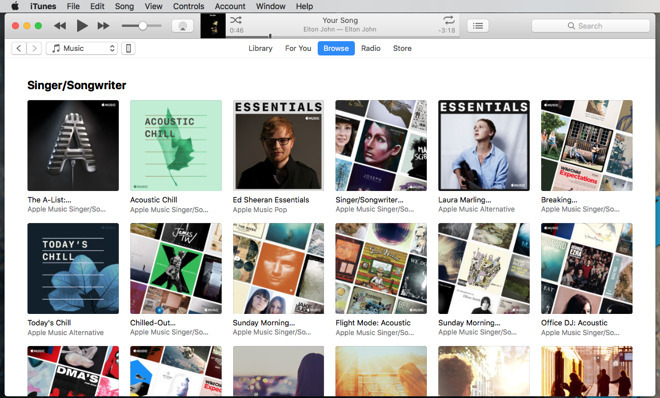 It does also happen if for any reason you have more than one iTunes account and you switch between them. In that case you also appear to lose all of your Apple Music playlists even when you go back to your original account. If that happens to you, go back to Settings and Music then switch on iCloud Music Library. You'll be asked whether you want to Keep Music or Delete & Replace, which is where we came in about 20 paragraphs above this one. You either loved or completely ignored the star rating system in iTunes but at least you had the choice. Now, Apple Music only grudgingly lets you add star ratings and then it has cut down on the potential uses of doing this. By default, there are no star ratings on any tracks in your Apple Music library. If you go to Settings, Music again, though, you can add the feature back. Switch on Show Star Ratings and then good luck finding them. They're hidden in the Now Playing pane. When you tap to listen to any music, it begins as a banner at the foot of the screen so that you can continue browsing your library. Instead, tap on the banner and it pops up to almost full screen. That shows you album artwork, a large volume control and the name of the track and artist. There is also an ellipses button at bottom right, though. Tap that and you get a popup menu over the popup artwork and at the very bottom of it there's an option to Rate Song. It only appears if that setting is switched on and you may also have to scroll to see it at all. The reason for it being so hidden away is that there is absolutely nothing you can do with a star rating —on iOS. What you can do is go to Apple Music in iTunes on your Mac and use them as the basis for a smart playlist. On the Mac, Apple Music has all of the features of iTunes. This means you could have it automatically create a playlist of all your five-star songs. You could tell it to give you an hour's worth of five-star songs that are country or western, that you've listened to more than 100 times but not in the last year. It is preposterous how complex you can make a playlist in Apple Music on the Mac but then that list transfers straight over to your iOS devices. 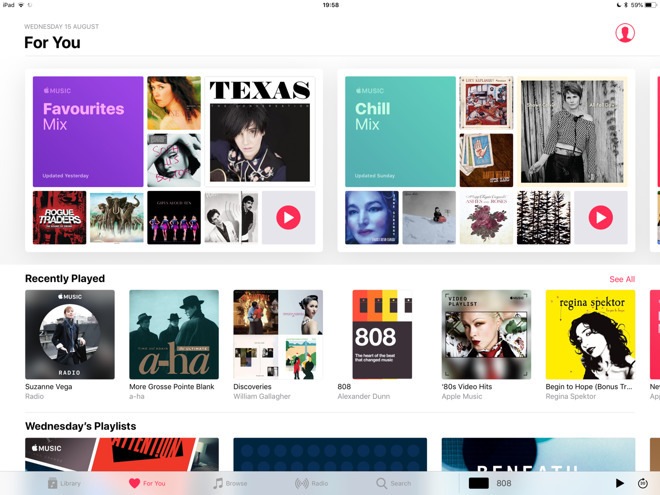 Rather than playlists of music you listen to a lot, you can tell Apple Music to play you new tracks. You can't help but see the main way of doing this: whenever you open the app on iOS, you're presented options including For You. Tap on that and you get a trio of playlists including a New Music one. This updates weekly and it is based on what you listen to the most but it's also as if it has moods. One week it will decide you fancy country music and the next it might be hard metal. It all has to be music you do like but still each week you get to wonder whether it'll be accurate or a throwback to what you listened to in the 1990s when you didn't know any better. As well as New Music, there is also Chill Music which is roughly the same except mellower. 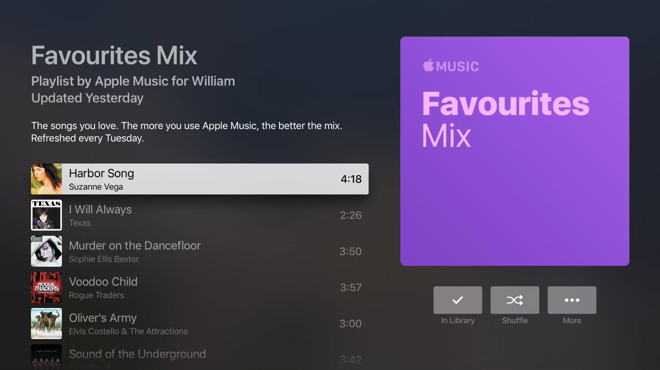 Then there's also Favorite Music which you'd think would be your favorite music but quite often Apple Music throws in someone you've never heard of. It's like the service is trying to nudge you into new listening habits. Which is odd because there is a whole swath of new listening options that it practically hides from you. Apple Music shows you a choice of possible source for music, ranging from your own library to the iTunes Store where you used to buy things. In between there is a Search and a Radio feature but there's also Browse. If you expected that Browse was just another form of search, look at it again. The Browse section opens with a New Music selection but then also other options including a series called The A List. Under every category of music, there is an A List which presents the best of it —as chosen by human beings. If you go into Browse on Apple Music on your Mac, find an A List for Singer/Songwriters and then instead chicken out and go back to your own library of familiar tracks, there can be a small problem. The next time you click on Browse, it takes you back to the point where you left it and there is no clear way to get back out to the main section. There is a back arrow but that will take you to wherever you just were. Instead you have to click on Browse again and this time it takes you to the top of the Browse section. 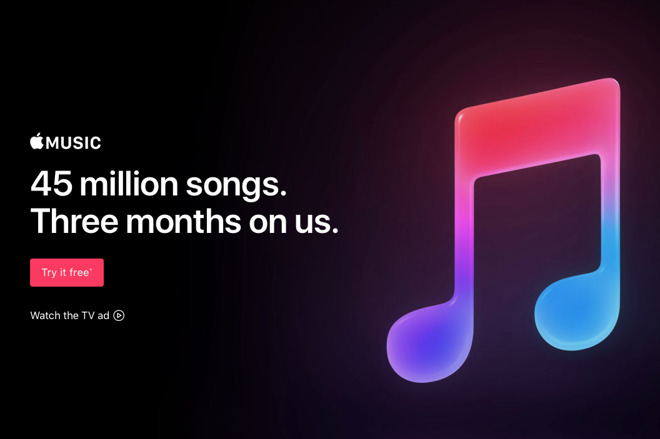 It's spectacularly easy to fall back into familiar playlists on Apple Music but the service does come with more than 40 million tracks. It does come with the ability to dive into all of those and a good chance of discovering music you will positively love. We would like some of its options to be less confusing but really the only thing we'd change is the star. Not the star rating but the little gray star that you see next to some tracks. That's Apple Music's way of telling you that a track is particularly popular amongst its subscribers and we don't care. Even if we were told just how many play counts or Likes it took to get a star, we'd still want to remove that thing and we can't. Maybe that's Apple's subtle way of getting us to buy HomePods where you don't see track listings or stars at all. Want to get 6 months of Apple Music for free? Verizon just announced an exclusive partnership with Apple, providing Verizon Unlimited subscribers with six months of Apple Music for free. This offer is available to new and current Verizon Unlimited customers upon registration.